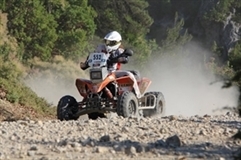 The hardest rally race in Africa brought success for the Bulgarian participant in ATV class - Todor Hristov. 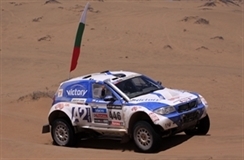 Despite injuring his hand during the second day, Hristov was able to finish third, passing 2000 kilometers in the desert . 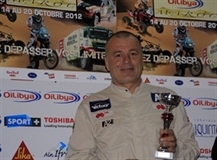 The race is a part of preparation for “Dakar 2013” and the Bulgarian Team was able to learn many lessons from this participation. 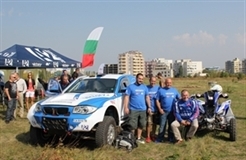 The other participant from “Bulgaria Off-road Team” – Orlin Alexiev was not able to fix the problem with the electronic of his BMW X1 and to finish the race. 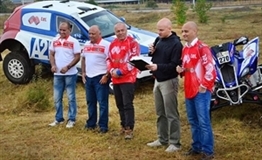 Hristov and Alexiev will take part in the National Off-road Championship at the end of this week in Dobrich, as Alexiev will fight to become a champion for 2013. 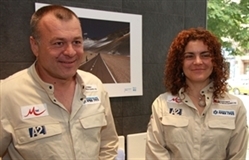 Bulgarian pilots Todor Hristov and Zornitsa Todorova will participate in “ABU DHABI DESET CHALLENGE” and “SEALINE CROSS COUNTRY” – first two rounds from the World Championship "Cross Country Rally WORLD CUP 2012". The race "Evia Rally Raid" is the second round of the "Balkan Rally Raid Cup" and it involved over 100 racers from Greece, Austria, Hungary, The Czech Republic, Italy, Albania and Bulgaria. In the quads class (ATV & QUAD) Zornitsa Todorova showed remarkable shape and gave no chance to her competition. The first round of the Balkan Cup Rally Raid was an extremely intense and difficult race with more than 180 motorcycles and ATV engines. 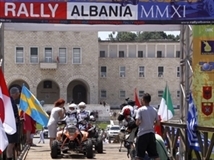 "Rally Albania 2011" was a challenge for both the contestants and their machines due to the difficult routes, long hikes and heavy competition of 11 countries. Exhibition "Dakar-A Dream Come True"
The champions in class ATV” from rally “Tunisia” and Bulgarian participants in the prestigious competition “Dakar 2012” – Todor Hristov and Zornitsa Todorova introduced an exiting pictures Stoyan Draev, Katerina Bojanova and Roumen Petkov , done during rally “Dakar 2011”.